It’s August. Big bluestem is tassling out, waving its turkey-footed seedheads against the sky. You understand why we call our Midwestern grasslands the “tallgrass prairies” after a summer like this one, filled with heat and rain. Everything on the prairie is lush. …flock to the Joe Pye weed, now blooming cloud-like with pale Indian plantain under the oaks in the savanna. It’s hot on the prairie. Tempers are hot, too, in the suburbs where I live. Earlier in the week, as I waited at an intersection for a light to change, the driver behind me laid on her horn. Honk! Honk! Honk! She wanted to turn right. My car, going straight ahead, blocked her way. I made the mistake of looking in the rear view mirror and saw her red face. She was shouting. I quickly looked away and prayed for the light to change. Turned up my Paco de Lucia CD (yes, I still have a CD player in my old Honda) and hoped the chords of Paco’s guitar would drown out her honking. Honk! Honk! Honk! Finally, an eternity later, the light turned green. My car moved through the intersection, and with a squeal of rubber, she turned right, still laying on her horn. I knew I needed a “prairie therapy” hike. Not that I need a reason to go to the prairie. But for 20 years now, I’ve found that an hour of walking a prairie trail or two siphons off built-up stress and alleviates a looming tension headache. The song of the common yellowthroat that hangs out in a tree by the prairie savanna trail, singing his “wichety, wichety, wichety,” is enough to erase some of that miserable “Honk! Honk! Honk!” from the soundtrack playing in my mind. And, oh, that August sky on the prairie! I’m reminded that, just a few days ago, one of my six little grandkids asked me if I’d cloud-watch with him. We lay back on the grass and watched the sky change from moment to moment, comparing clouds to other objects—a ship, a turtle—in the same way people have cloud-watched from time beyond memory. I think of this as I hike the prairie now, watching the cumulus clouds floating lazily overhead, casting shadows on the tallgrass. I stop on the bridge over Willoway Brook and look into the stream. The dragonflies and damselflies are in a frenzy of reproduction. Do they sense the downward seasonal slide toward autumn? Maybe. The American rubyspot damselflies hang low over Willoway Brook on blades of grass, waiting for potential mates. Such anticipation! Like speed dating. The grasses are slipping into their late summer colors. Switchgrass, big bluestem, and Indian grass ripple in the wind, with a sound like rustling silk. The flowering spurge mists the grasses with its delicate white blooms. High-pitched sounds overhead cause me to look up. It’s the Canada geese, flying to a 18-hole course nearby to terrorize the golfers. These are kind of “honks” that don’t raise my blood pressure. As I pass the bench that overlooks the prairie trail, I see a pile of coins, mostly quarters. Doubtless, someone has paused to rest, and their change has spilled from a back pocket. I leave the coins. Maybe they’ll realize their loss, and backtrack, looking for their cash. Or perhaps some other hiker having a bad day will pocket the change, and feel a bit more cheerful. I don’t need a cash windfall to improve my mood. The prairie hike has already worked its magic . My day is transformed. My blood pressure is lowered, my perspective is more positive. All it took was a little prairie therapy. Emma “Grandma” Gatewood (1887-1973) lived a difficult life. After brutal abuse by her husband—and raising eleven children under tough circumstances—she decided to go for a walk at age 66 on the Appalachian Trail. She became the first woman to hike it solo in one season. By age 77, she had hiked the 2,000-miles-plus AT three times through, plus the Oregon Trail. She wore tennis shoes for most of her hikes. Gatewood was the quintessential ultralight backpacker, with a simple bag she sewed herself holding very few supplies. Gatewood often relied on the kindness of strangers, who sometimes fed and sheltered her for the night. But, she also spent time sleeping under a shower curtain (her tent) and picnic tables along the way. “After the hard life I lived, this trail isn’t so bad,” Gatewood told reporters. Ben Montgomery’s book, Grandma Gatewood’s Walk, is well worth the read to follow the grit and willpower of an inspirational woman. All photos copyright Cindy Crosby (top to bottom): big bluestem (Andropogon gerardii), Schulenberg Prairie, The Morton Arboretum, Lisle, IL; black swallowtail (Papilio polyxenes), Nachusa Grasslands, The Nature Conservancy, Franklin Grove, IL: Joe Pye weed (Eutrochium purpureum) and pale Indian plantain (Arnoglossum atriplicifolium), Schulenberg Prairie Savanna, The Morton Arboretum, Lisle, IL; sky over Nachusa Grassland, The Nature Conservancy, Franklin Grove, IL; Schulenberg Prairie Savanna trail, The Morton Arboretum, Lisle, IL; August skies on the prairie, Schulenberg Prairie, The Morton Arboretum, Lisle, IL; American rubyspot damselfly (Hetaerina americana), Schulenberg Prairie, The Morton Arboretum, Lisle, IL; flowering spurge (Euphorbia corollata), Schulenberg Prairie, The Morton Arboretum, Lisle, IL; Canada geese (Branta canadensis), Schulenberg Prairie, The Morton Arboretum, Lisle, IL; cash on the bench, Schulenberg Prairie, the Morton Arboretum, Lisle, IL; the prairie in August, Schulenberg Prairie, The Morton Arboretum, Lisle, IL. August takes her last breath. Insects stitch together the transitions between daylight and dark. When we open our bedroom windows to welcome the cooler air at night, their high-pitched chorus lull us to sleep. ZZZzzz. Mornings in Illinois take on a clean, cold feel. A sudden drop into the 40s at night prods us to reach for our jackets; we don’t know how to dress for the day ahead anymore. Layers. We add a sweater, peel it off by 10 a.m.
September is so close you can feel it. Time to turn the seasonal page. The blue gentians bloom at last. They’re a specialty reserved for autumn’s introduction. A trumpet blast of jewel-like color. In my backyard, sandwiched between suburban houses, the prairie patch puts out a few, tentative asters. Joe Pye weed blooms brown up. I find my new Kankakee mallow plant stalks, grown from expensive plant plugs this spring, abruptly cut in half by sharp bunny teeth this morning. Will they survive the winter? Maybe. Or maybe not. …and close beside it, the great blue lobelia are at their best, pumping out bright blue around the pond with the promise of more flowers to come. Each day, I watch a few more new England asters slowly unfurl their purple fringed blooms on the prairie. Little bluestem is prominent now, blizzarding the prairie with rusts and tufts of snowy white. Hummingbirds, driven by the migration impulse, battle over my dew-drenched feeder each morning. They fuel up on whatever wildflowers they can find in my backyard prairie, then zip away, always moving south. Love it or moan about it: Autumn always brings with it a sense of our own mortality. The great rush of plant growth is over. It’s replaced with the Earth’s concern for legacy. The plants push each other over in their exuberance to crank out seeds, seeds, more seeds. The community of the prairie transforms. Soon, it will be dry grasses and seedheads rustling in an increasingly chill breeze. Widow skimmer dragonflies perch around prairie ponds, anticipating this. They watch other dragonfly species begin to migrate. But no trip to the south for them. They await the tipping point that ends their season. What will the autumn bring? Beauty of its own kind, yes. But now, at the tail end of summer, we feel a bit melancholy. The prairie promises a new chapter. Who can tell what it will bring? We remind ourselves: the best days may lie ahead. It’s up to us to accept change. And to embrace it. All photos copyright Cindy Crosby (top to bottom): unknown grasshopper on wild Canada rye seedhead (Elymus canadensis), Schulenberg Prairie, The Morton Arboretum, Lisle, IL; prairie gentians (Gentiana puberulenta), Schulenberg Prairie, The Morton Arboretum, Lisle, IL; interior of prairie gentian (Gentiana puberulenta ), Schulenberg Prairie, The Morton Arboretum, Lisle, IL; purple Joe Pye weed (Eutrochium purpureum), author’s backyard prairie patch, Glen Ellyn, IL; Eastern cottontail rabbit (Sylvilagus floridanus), author’s backyard prairie patch, Glen Ellyn, IL; cardinal flower (Lobelia cardinalis), author’s backyard pond, Glen Ellyn, IL; great blue lobelia (Lobelia siphilitica), author’s backyard pond, Glen Ellyn, IL; New England aster (Symphyotrichum novae-angliae), author’s backyard prairie, Glen Ellyn, IL; little bluestem (Schizachyrium scoparium ), Nachusa Grasslands, The Nature Conservancy, Franklin Grove, IL; ruby-throated hummingbird (Archilochus colubris) at the feeder, author’s backyard pond, Glen Ellyn, IL; wild Canada rye (Elymus canadensis) seedheads, Schulenberg Prairie, The Morton Arboretum, Lisle, IL; widow skimmer dragonfly (Libellula luctuosa), Nachusa Grasslands, The Nature Conservancy, Franklin Grove, IL; Schulenberg Prairie at the end of August, The Morton Arboretum, Lisle, IL. Take a walk with me. Let’s see what’s happening in the tallgrass in August. Pink gaura, that tall prairie biennial that goes unnoticed until it bursts into bloom, shows its shocking color for the first time all season. Where have you been hiding? You wonder. White goldenrod underpins the grasses; its common name an oxymoron. Violet sorrel flowers glow low in the grass. They’ve decided to put on a second flush of blooms this season. Applause! Lavender obedient plant spikes across the prairie. Move each bloom around the stem and it stays where you put it; thus the name. Better than a fidget spinner! Have you noticed the green caterpillar-ish seeds clinging to your shirt, your pants, and your socks as you walk? Tick trefoil, that hitchhiker of the August prairie, is guaranteed to show up in your laundry room for the next several months. A souvenir of your time in the tallgrass. …a slender spreadwing damselfly perches. Its wings appear spider-web delicate. But they are seriously strong. Deceptively so. …while nearby, a bronze copper butterfly snaps her wings open and shut. So much to see on the prairie in August. But don’t wait too long to look. Autumn is on the way. The opening lines in this blogpost are from the poem, “August Moonrise,” by Sara Teasdale (1884 –1933). Teasdale, a native of St. Louis, won the Pulitzer Prize in 1918 for her poetry collection, Love Songs. Many of her poems have been set to music. She committed suicide at age 49. All photos copyright Cindy Crosby (top to bottom): biennial gaura (Gaura biennis), Schulenberg Prairie, The Morton Arboretum, Lisle, IL; white goldenrod (Oligoneuron album), Schulenberg Prairie, The Morton Arboretum, Lisle, IL; violet wood sorrel (Oxalis violacea), Nachusa Grasslands, The Nature Conservancy, Franklin Grove, IL; obedient plant (Physostegia virginiana), Schulenberg Prairie, The Morton Arboretum, Lisle, IL; Illinois tick trefoil (Desmodium illinoense), Schulenberg Prairie, The Morton Arboretum, Lisle, IL; wetlands, Nachusa Grasslands, The Nature Conservancy, Franklin Grove, IL; male slender spreadwing damselfly (Lestes rectangularis ), Nomia Meadows Farm, Franklin Grove, IL; American bullfrog (Lithobates catesbeianus or Rana catesbeiana) bronze copper butterfly (Lycaena hyllus), Nachusa Grasslands, The Nature Conservancy, Franklin Grove, IL; August prairie, Nachusa Grasslands, The Nature Conservancy, Franklin Grove, IL. Every prairie year has its own personality. Every season in the tallgrass is full of surprises. Thank you for hiking the prairie with me on Tuesdays in 2015. I hope you’ll enjoy this retrospective of the Illinois prairie, month by month. Who knows what wonderful things are in store for us in 2016? Winter is a good time for naps, as these shaggy bison know. Bringing buffalo to Nachusa Grasslands in Franklin Grove, IL, was a culmination of a dream for many prairie restorationists. In 2015, we watched the herd grow and a new bison unit open. Windy winter skies bring their own motion to the prairie, rattling the brittle grasses and seedheads. Fire is to prairie as water is to life. Because we suppress wildfires, prairie restorationists must used prescribed burns to ensure the prairie regularly goes up in flames. Only a few weeks after all is soot and ashes, the prairie turns emerald with new growth. It’s a resurrection of sorts. A chance for new beginnings that inspires even the most jaded and cynical observer. A great egret keeps watch over a wet prairie, scanning for small frogs and fish. As spring breezes ripple prairie ponds and streams, the sounds of insects, frogs, and birds add their notes to the tallgrass soundtrack. Dragonflies emerge. 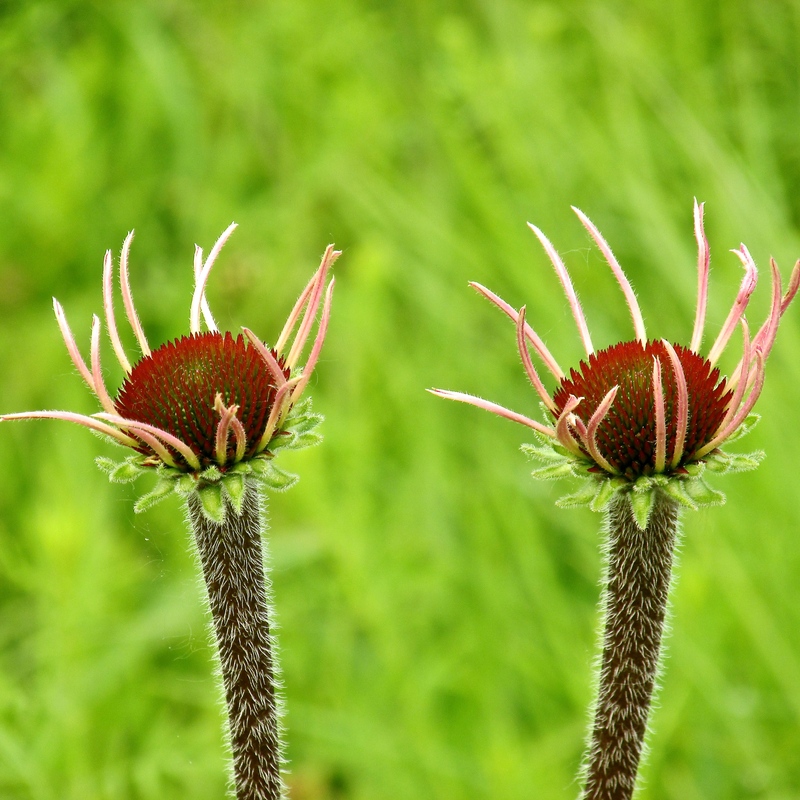 Pale purple coneflowers open, heralding the beginning of summer on the prairie. Once revered for their medicinal value, today we appreciate them for their verve and color. Like badminton birdies, aren’t they? Moist conditions helped queen of the prairie have a banner year in 2015. Dragonflies are all around us in the warmer months. In July, they clamor for our attention with their numbers and bejeweled colors. Here, a blue dasher looks out at the prairie with its complex eyes. Below, an American rubyspot hangs over a stream rushing through the tallgrass. Bee balm rampaged across the prairie in 2015; monarchs sipping beebalm nectar approved. There was good news for monarch butterflies this year — from the tollroads in Illinois which will fund milkweed plantings; to increased numbers of monarchs this season. Without volunteers, the prairie restoration efforts in the Midwest would be a moot point. Here, a volunteer from an Illinois church group collects seeds on one prairie that will be used to plant a different site. Asters are the floral bon voyage to the prairie blooming season. It’s bittersweet to see their purples, whites, and golds across the prairie. We know winter is just around the corner. The goldenrods join the chorus of goodbyes each autumn. Milkweed, including this common milkweed, got a lot of attention in 2015 for its value to monarchs. Did you plant some? If not, there’s always next year. Who says December has to be colorless? In some years, the prairie palette seems to catch fire as winter begins its slow drain of colors from the tallgrass. The oranges, yellows, and reds are a reminder of the prescribed fires that will burn in the spring; waking the prairie up to a new season of life. I began my first blog entry this year with the image above; it seems fitting to close out this prairie season with it. Looking forward to hiking the tallgrass on Tuesdays with you in 2016. All photos copyright Cindy Crosby (top to bottom): bison in the snow, Nachusa Grasslands, Franklin Grove, IL; winter sky, NG; prescribed burn, Schulenberg Prairie, The Morton Arboretum, Lisle, IL; after the fire, SP; great egret, NG; pond life, NG; Echinacea pallida, SP; Echinacea pallida, SP; queen of the prairie (Filipendula rubra); blue dasher dragonfly, SP; American rubyspot, NG; bee balm (Monarda fistulosa) and monarch butterfly; volunteer, SP; smooth blue asters (Symphyotrichum laeve), SP; New England asters (Symphyotrichumnovae-angliae) and goldenrod (Solidago spp. — there were several species represented in this particular patch where I photographed, and the IDs are uncertain) SP; common milkweed (Asclepias syriaca) DuPage County Forest Preserve; late December grasses, NG.